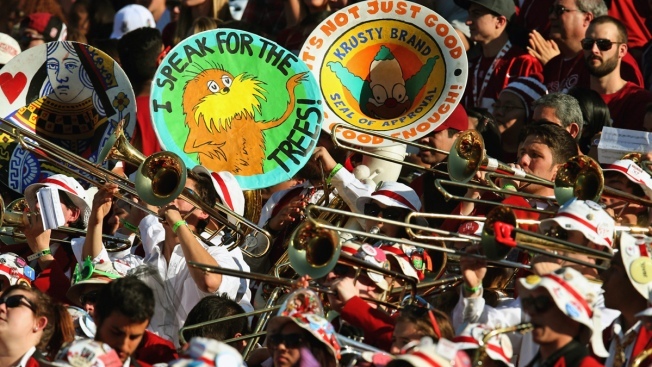 Stanford University's marching band has been prohibited from performing at away games for one year due to bad behavior. According to a statement posted by Stanford University officials, members of the Leland Stanford Junior University Marching Band were found to be involved in illegal activities including hazing, underage drinking, drug consumption and sexual harrassment. "The university's objective is to ensure a safe and harassment-free environment while honoring the band's traditions and its unique, irreverent identity," Associate Vice Provost and Dean of Residential Education Deborah Golder said in the statement. "We hope the band will use this outcome as a positive platform for further strengthening its culture and ensuring the band's vibrancy and good stewardship in the years ahead." The ban will take place during the 2015-16 academic year. The marching band will also be required to adopt a number of reforms. The statement added that the band could choose to appeal this ruling with the Vice Provost of Student Affairs. The Chronicle noted that the Stanford Band has long held a reputation for misbehaving, including making fun of nuns during a 1991 game at Notre Dame, and skewering polygamy at Brigham Young in 2004.